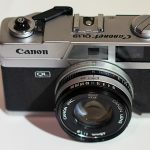 Canonet QL17 GIII camera has a faster 40mm lens, versus the Canonet QL19. But, when features are compared, how different are they really? When I say that the Canonet QL17 GIII is like the Canonet QL19, I’m only being slightly facetious. Certainly, they both look, weigh and function pretty much the same as each other. But the QL17 GIII does have some advantages compared to the QL19. 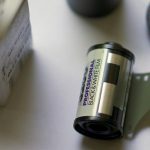 When I wrote about the Canonet G19 rangefinder I waxed lyrical about the shutter priority mode, as well as the quietness of its shutter mechanism and the ease of film loading. Well, all of those features are duplicated in the Canonet QL17 GIII. Once again, the QL in the name stands for ‘quick loading‘. You simply place the film into the chamber and wind the film on. Not fully automatic, but as close as it gets. The shutter priority mode works exactly the same as in the QL19. This ‘automatic’ mode allows the shutter speed to be controlled whilst, at the same time, keeping an eye on the aperture speed in the finder window. Something that I didn’t mention in my QL19 review is that, whilst the aperture meter display in the finder window is clear and useful, it could be potentially distracting. Your mileage may vary. The shutter itself is, once again, satisfyingly quiet and smooth. OK, neither the QL19 or this camera are Leica quiet or Leica smooth but, for what they are (and the cost) they are pretty decent. 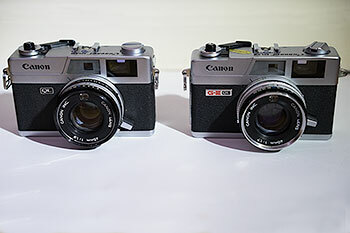 Canonet QL19 (left) and QL17 G-III (right), side by side. Where the Canonet QL17 GIII is different from the Canonet QL19, is the lens. Firstly, the built in lens is a 40mm prime, as opposed to the 45mm lens of the QL19. Also, the lens is faster, coming in at ƒ1.7 versus ƒ1.9. 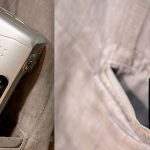 The other noticeable difference between the Canonet QL17 GIII and the Canonet QL19, is the addition of a battery check button and light, next to the viewfinder, on the back of the camera. Other than that, the cameras are pretty much the same. Shutter speeds for the Canonet QL17 GIII range from 1/4 up to 1/500. Film speed settings range from 25 to 800 ISO and the self timer works exactly same (it’s a little lever on the side of the lens). Those with more technical knowledge might point out that the lens is made of six elements in four groups, as opposed to five elements in four groups. But I wouldn’t even be too sure what any of that means as regards quality of photographic images. Especially, with 40+ year old cameras. For me, the ƒ1.7 lens is the biggest advantage, especially if low light photography is an aim. Overall, the Canonet QL17 GIII is a compact and easy to use 1970’s variety of point and shoot film camera.